Description: Yum Yum. Chow down on your favorite frosted treats! Put together a delicious one of a kind cake then co-ordinate with more cake, ice cream, milk shakes, candies, frosting, and fudge for the ultimate dream dessert! 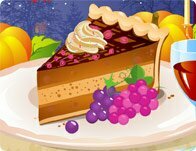 Instructions: Use your mouse to click on and through the floating cake, icing and candy topping menus! Then co-ordinate with different ice cream, cupcake, milk shake and frosting covered everything side dishes for an ultimate dream dessert treat.